On Long Expeditions last week, an Aiglon group were the final guests at a local mountain hut. The Cabane Roseyres near Lac de Retaud above Diablerets is being sold to private owners, and an Aiglon Long Expedition group last weekend were its final guests. These mountain huts scattered about the Alps are an iconic part of Aiglon's expeditions programme, and many students remember them well. Each hut keeps a formal guest book, the "Livre de Cabane", registering everyone in typical Swiss fashion, who stays the night. 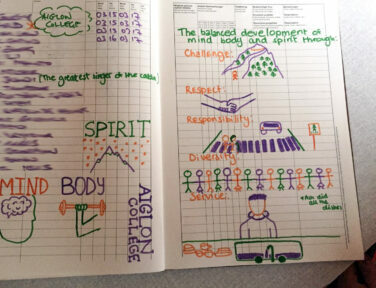 For its final entry, Aiglon student Iana (Le Cerf, Year 11) was given the chance to decorate the book with Aiglon's Guiding Principles. We think this is a fitting farewell to a cabane that has served Aiglon well! The group enjoyed their stay and were delightful company. From fondue night to ‘Chalet Shout ©’ with quizzing, snowshoeing and snowman-building. It was an enjoyable, final night for the Cabane Roseyres.